Hey guys, Name is MIke. I am obviously a star trek nerd. I like to read, listen to music, game online with my mates, and of course watch star trek in my spare time lol. I am looking to date a nerd like me to be honest, Someone who I can nerd out with over star trek quite frankly. Other interests include, aviation, astronomy, technology, space exploration. If you wanna chat, feel free to open a channel! I don't watch TV, as i don't have cable (Never used it lol) So I stream on Netflix a lot.. and you guessed it! I stream a lot of star trek. I also watch The X-Files, Thunderbird's are Go, Riverdale, The 100, Shadow hunters, Family Guy, The Orville. I really Enjoy actual horror movies, not the gore fest that they have all become now, I like the kind that leaves you on the edge of your seat. Action movies are fantastic for getting you in the moment. So I am what they call eclectic with my music, I like all types, I can go from listening to a orchestral piece, to a country song, to some pop, then off to a rock song, then back to orchestral, and then off to some house music. I have a wide range of books I like to read. I can go anywhere from reading one of my favourite fiction books "The Tragedy Of Miss Geneva Flowers" To reading some giant book about the Queen Mary 2. I have always wanted to try sky-diving, I would love to learn to fly a plane someday as well. I am not sure I have a goal in life, other than to live life, you only get one, why not live it. I look for someone who has a good head on their shoulders. You could be the hottest guy on the planet, but if you are as dumb as a door nail with the emotional range of a teaspoon then I would move on. 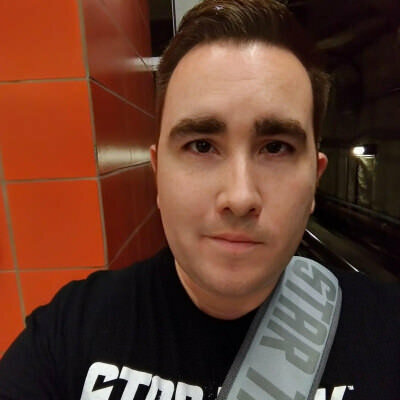 I would ideally also look for someone who shares the same passion as I do for all things Trek. A coffee date, or dinner date is always a good place to start, and depending on how the date goes, maybe go for a walk, or catch a concert at the Winspear, or maybe even a play at the Citadel.